This article is about the character. 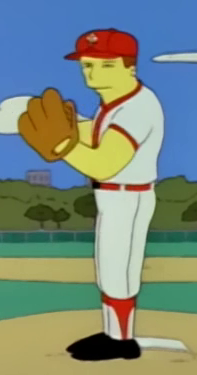 For the guest star, see Roger Clemens. Roger Clemens is a baseball player and was one of the players in the Springfield Nuclear Power Plant softball team. Waylon Smithers, Jr. goes to visit him to ask him to come work at the Springfield Nuclear Power Plant so that he could join the softball team. He accepts and becomes the security guard for the power plant. Before the final match of the season, he was hypnotized to think he was a chicken by the hypnotist so he couldn't play. Modified on August 6, 2013, at 18:07.